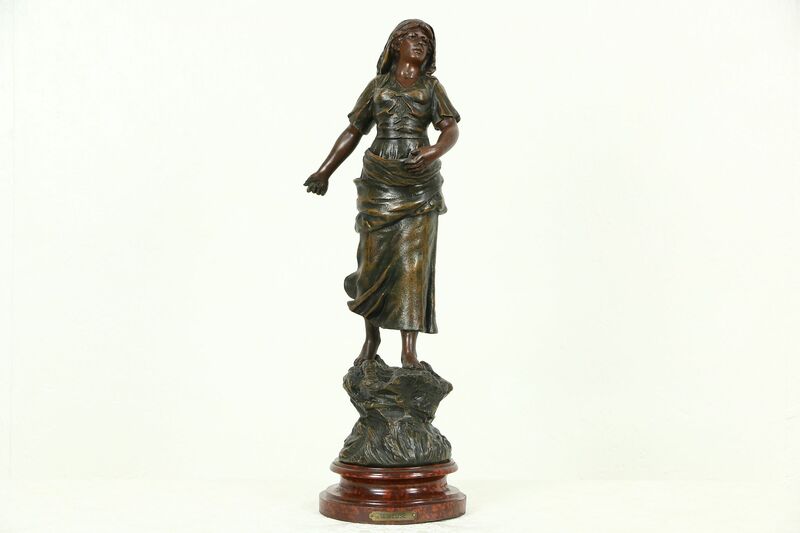 A French sculpture of a young woman "Semeuse," or a "sower" planting seeds from about 1900 is signed "Mestais." Little is known about the artist, and there is also a foundry mark and "France." The original deep green and bronze patina are in very good condition on this antique work of art, which was cast in spelter, a white metal alloy similar to pewter. The wood base was hand grained with an original red marble finish. Barefoot, the figure stands in field, captured midstride as she plants grain. Size is 24" tall and 9" across, the base is 7 1/4" diameter.